Grace on Wings was truly an answer to prayer. My mother, who is 89 years old, fell and the fall put into place a number of medical problems that required hospitalization and rehab. As she was nearing the end of the rehab stay my brother and I knew we had to make some decisions. Our mother lives in Tennessee, my brother in Georgia, and I live in Virginia and it was obvious she could no longer live alone and needed to live near family to help manage the continuing medical problems. Moving her to Virginia meant a two-day car trip which we knew she could not tolerate. After finding Grace on Wings on the internet my brother contacted Shelli and immediately we knew our prayers had been answered. Shelli and the entire team could not have been more gracious, caring, efficient or professional. Even the discharge planner at the hospital commented about how easy it was to work with Shelli and how she knew exactly the right information to ask for. We were more excited to learn my brother could accompany our mother on the flight to Virginia. On the day of the flight my brother sent pictures of the jet, some in-flight pictures, and Shelli called to let me know they had landed. 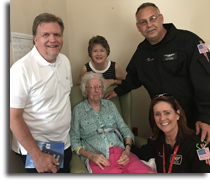 I was able to meet my mother with the Grace on Wings crew at the facility where she is continuing to receive rehab. Meeting Shelli and Hal was like meeting old friends. Before they left they read Scripture and had prayer with us. I thank God for the men and women who established this ministry and for those who continue it’s very valuable mission today. Thank you for sharing the gifts God gave you with others!